Types of Malaysian durians, tastes, and pricing. Back in the good ol’ days of mobile phones that could only make calls and send text messages, durians were just about as simple as technology was. All a durian lover needed to know was how to distinguish Malaysian ‘kampung’ durians from Thai durians. The D18 was sweetish, with a faintly bitter aftertaste. While the flesh was a tad on the watery side, it was nonetheless very satisfying and a perfect choice for durian lovers who aren’t keen on mega rich and creamy textures. At RM16 per kg, it’s also one of the cheaper durians available after durian kampung. If thick, gooey, rich, and creamy flesh is what you fantasise over, then head straight for the D24s. I almost had problems getting the first mouthful down my throat! The taste of the durian, though, was rather mild compared to its texture, and sweetish. If you go for more mouth-feel and want a really filling durian experience, but are not too keen on strong flavours (and smell), then D24 is your thing. Pricing for the day was RM18 per kg. The flesh was bittersweet, definitely slightly more on the bitter side. If you love bitter durian that isn’t dry, then Teka would be perfect for you. The texture was a bit on the watery side, although this species of durian usually yields creamy, gooey flesh. At RM25 per kg, it’s worth the price but be sure to check with your durian seller if the flesh is creamy or watery. According to Sue from Donald’s Durian, the texture of the durian flesh is very much dependent on weather conditions. So to be sure you don’t get disappointed, just ask, and hopefully your durian guy is honest. 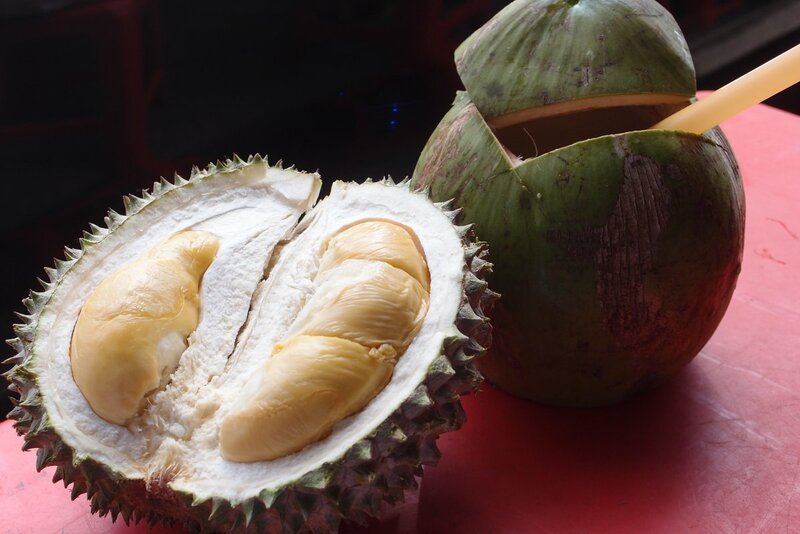 This species is fairly new in the market, and the durians hail from Penang. The orange-tinted flesh is extremely creamy and thick, filling your mouth with a decadent, luxurious mouth-feel. However, the taste was disappointingly mild. We expected so much more, but the durian could neither be classified as sweet, nor bitter. At a whopping RM36 per kg, I wouldn’t give it another try unless the durian seller convinces me the ones we tried were not the norm. The Red Prawn durians also hail from Penang, and are characterised by the reddish-orangey colour of the durian flesh. The durian tasted sweet, and flesh slightly watery. Not a very memorable experience, but at RM16 a kg, it’ll still manage to satisfy those cravings and leave you some balance to try other durians. Possibly one of the most popular grades of durians now, Musang King really lived up to its name of being worth every sen you pay for it. At first bite, you will be overcome with the sensation of rich, creamy, and smooth flesh that glides effortlessly down your throat. 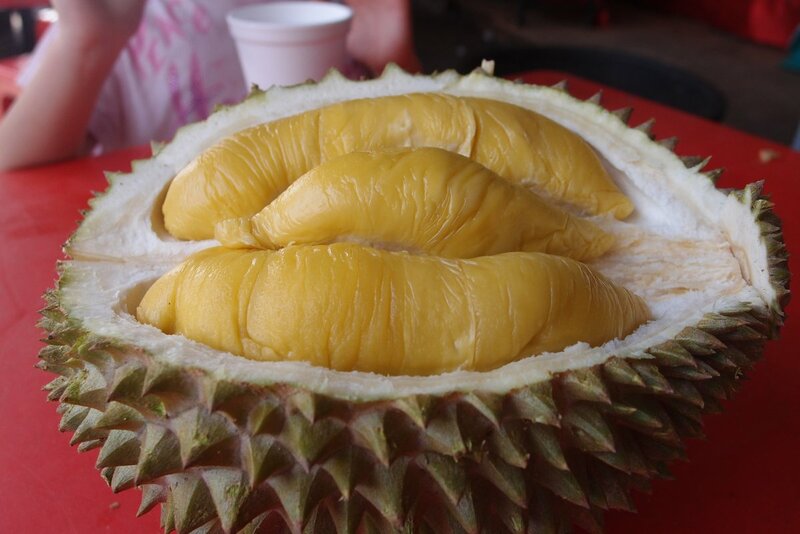 The Musang King’s flesh is bitter and dry, just the way we love it. Definitely worth the RM32 per kg we paid for it. Prices range from as low as RM22, depending on the size of this Pahang native. The XO durian is probably the bitterest durian I have ever tasted … and I absolutely loved it! Its colour can be a bit deceiving as it is pale, and looks a bit like curdled cream. 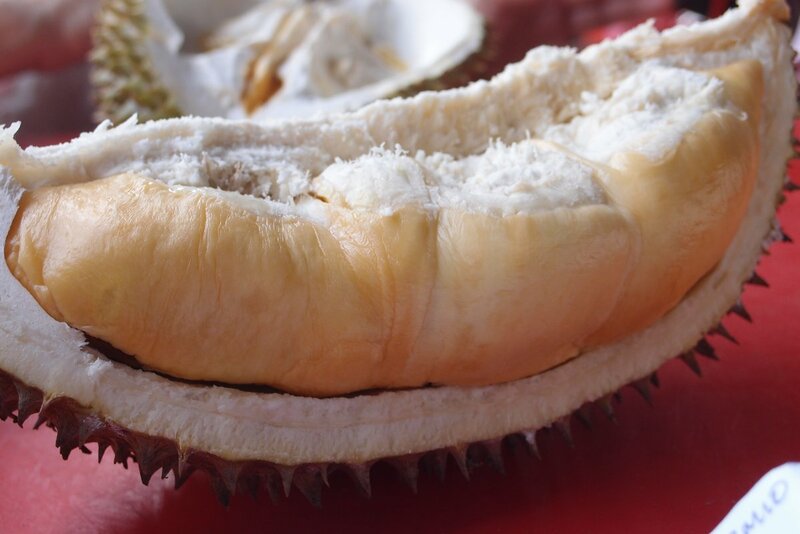 But as soon as the durian enters your mouth, you forget about the need to be civilised in a public place because you just can’t help but get all dramatic over the soft, creamy, and gooey flesh. The dryness and heavenly bitterness hits you immediately, and the fact that the seeds are tiny just increases the enjoyment level because that just means more flesh. XO was priced at RM25 per kg that day, and totally worth every sen! 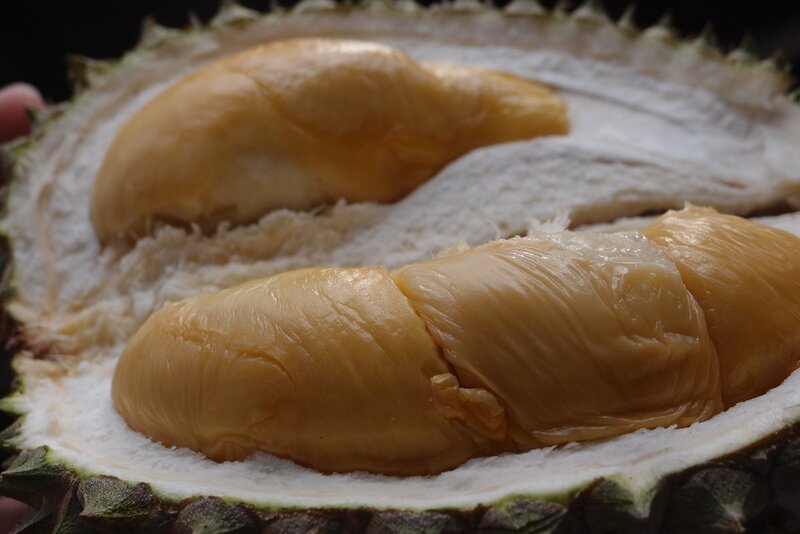 A must-try for bitter durian lovers who want to veer away from the more popular Musang King. 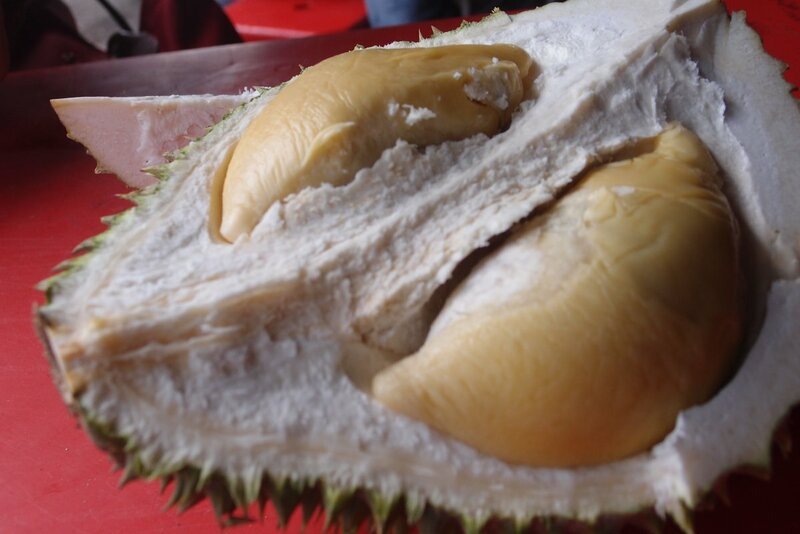 So there goes our taste test of some of the most popular durians available. Now it’s time to head out to satisfy those cravings. Now that’s how you gorge on some tasty durian! Published on 28 August 2014. NOTE: The prices of durian as of the time of publishing. This is a really nice guide. I love the pictures! 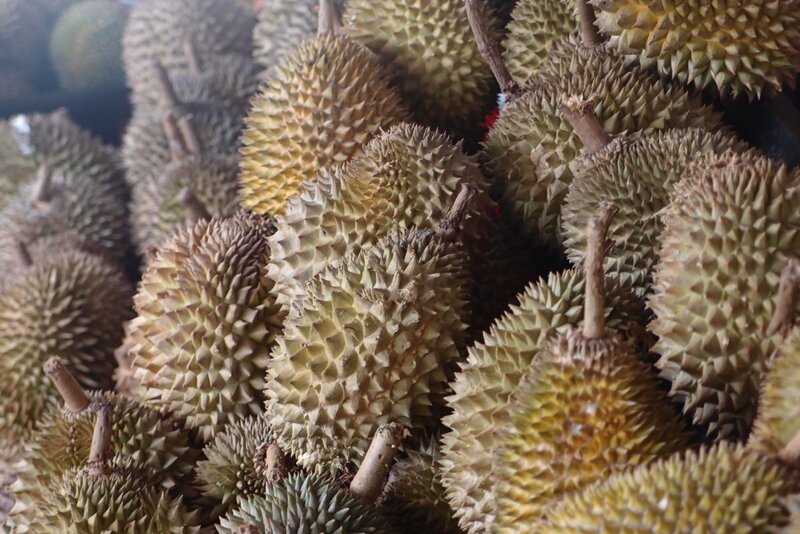 Very informative, providing a very detail descriptions of the most popular durians grown in Malaysia. I will then definitely take the Musang King for my dinner tonight. Great Martin, enjoy your Rolls-Royce Musang King! Like and share my posts and vlogs. Appreciate the effort and information. But you’ve got the same durian photo for Musang King and XO, which obviously is incorrect. Also, the durian shown in Red Prawn does not look like Red Prawn either. 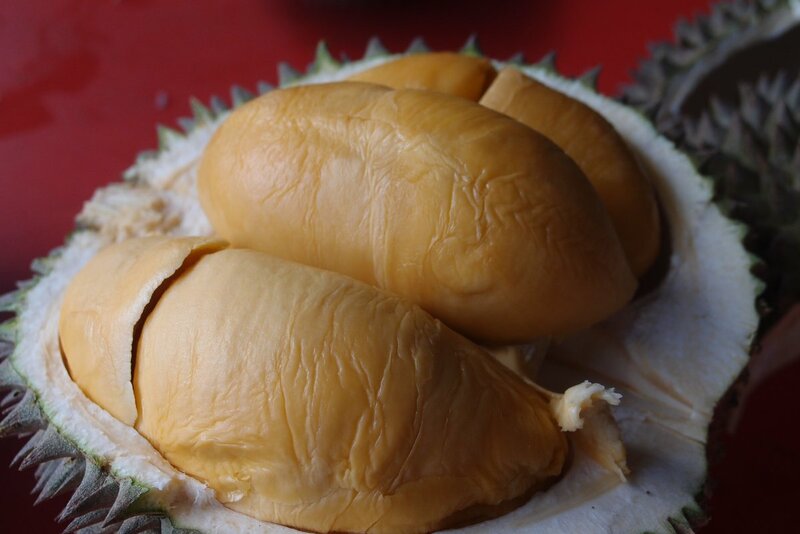 The photo shows a durian flesh that’s more yellow than the orangey-red of Red Prawn durians. Still appreciate the effort, though. These are prices as of the date of publishing in August 2014.